I was going to queue this and have it appear later, but as I recently showed the first member, I thought it opportune to post them in a more timely manner. I’ve really enjoyed working on these in the short bursts I’ve been able to. to the point that I’ve plans to build a few more. These guys have come out quite well, especially considering they are on their third total rebuild and repaint. Well okay, probably only the packs and torsos and maybe one or two pairs of legs, but back when the Y2K bug was something we all worried about these guys were Blood angels. About four years ago they were ultramarines. now they get to be Wolves. If you’d allow me a great heresy, there's a corner of my mind that’s desperate to convert up a Dante “counts as” and buy a couple of Stormraven to run a space wolf painted counts as blood angels jump force. Maybe… it’s for sure the only way to get a SW SR outside of apoc.. ohh i could use em for apoc too…. Anyway, close up pics incoming. first up, this basic grunt has been bored on the dropship and has been graffiting on his weapon. The flamer marine is one of my favourites for the pose and dynamism, yes, space wolves use woad now. not sure why, just felt right. I expect to be doing more of it as the army progresses. Pfist marine. and yes, if I were ever to proxy them as BA this would be the Vet Sgt. as such he’s got a bit more decoration and posher legs than his compatriots. Another line trooper, not much about him, except that is helmet was a pita to colour match in, something about the red throws out the colour perception, makes the whole helmet look darker. There we have it, although if you’ve got this far I do have a couple of questions.. are they finished? I am contemplating a little damage/scratching on the plain armour expanses, and also some gore on the chainblades. I am yet undecided as to whether to go ahead with these final steps, and the advice of the community would be appreciated. The last pic of the post sees them reunited with their Wolf preist. More later on the scenery they find themselves amongst. I'm going to guess NMM is a ton of work when applied over a whole model... much less a squad. I've only done it in a few very small spots and it took me forever. On that alone, I commend your effort here. While it might be a bit rough looking in some places, I'm willing to bet you've learned more with this squad than any other model before. Gorgeous work! Love the NMM gold you've done, and all the little personalizations for the weapons and facepaint really make them pop. Great stuff! Pure beuaty Karitas. Real works of art. I love the facial tattoos. I don't know why, but I hadn't even considered that for my Space Wolves, but now I'm definitely going to have to put some markings on their faces to break up the monotony. Wow, thanks for all the nice comments guys. Ron, yeah, you nailed it. its taken me about five times as long to do these guys than a "normal" squad, but I have indeed learned a hell of a lot. I'll be honest, more often than not the bits where it looks rough are most likely down to being burned out and not caring, than either being unaware or unable to fix it :) it's a whole different "zen" apporoach, and that thing in the back of your head going "finishthearmyfinishthearmyfinishthearmy" has to be supressed. 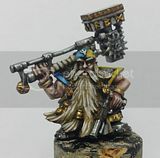 I think these guys also mark the beggining of really trying to find the character of the army, and the woad/decoration wil help to pull together a unified look across several great companies. anyway thanks everyone, I', glad you like tham and that there's something for some of yout ot ake away form this post. You have not only pushed your own skills to far reaches of the warp but you have twisted my mind in awe at the compelling nature of your argument for the colour done. I hope you don't mind me giving your post a shout out on my weekly themed top x. Cheers and thanks for sharing.